Hello everyone, I'm a real estate agent located in serving the needs of luxury and move up residential buyers and sellers in the Greater Indianapolis area. 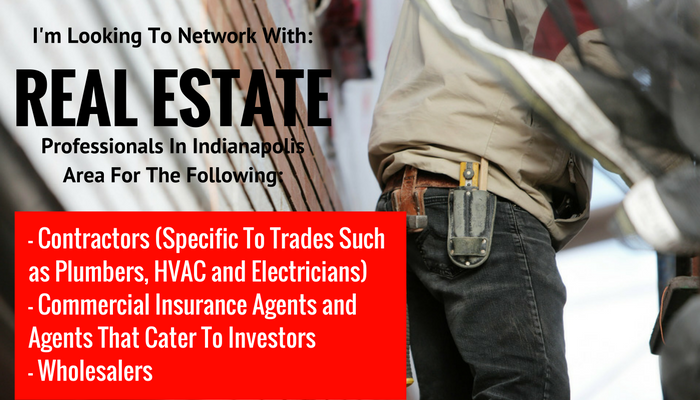 With a history of home rehab and resale to consumers on the North Side of Indianapolis as well as a background in value add property management, I'm looking to leverage my experience as to create a network of professionals to buy properties for rehab and resale in multiple areas of Indianapolis. Goals are to discuss my clients and well as my goals over the next three months and beyond. Working with the local professionals would be a plus as I look to make our city better with fellow residents. Looking to hearing from you and setting up some meetings for the next couple of weeks. I am a newer investor in the Indianapolis area just graduated from IU with my MBA. I am interested in properties to rehab and sell in northern Indianapolis as well as up and coming neighborhoods in and around downtown. Would love to connect with anyone that I might be able to help or vice a versa. I would love to connect with you as I am looking for connections in the Indianapolis are. I am originally from Indianapolis and just recently moved to the California area where I have built some good relationships in the real estate business with people whom are interested in investing in the Indianapolis area. Hi Jimmy, I'm an Insurance Broker out in California but I have license throughout the US. Let me know if I can be help to you. Look forward to talking to you.